I’ve only read two books by José Saramago (Blindness and The Double), but I was over the moon about them both. They’re both dark and strange, and the narrative voice is unconventional and distinctive. (The two books I read were translated by different people, but the voice retained its idiosyncratic style.) When I saw Small Memories, Saramago’s memoir of his childhood on Netgalley, I had to give it a try, but I wondered whether his quirky voice would translate well to a form more firmly grounded in reality than the dark fantasies of his other books. 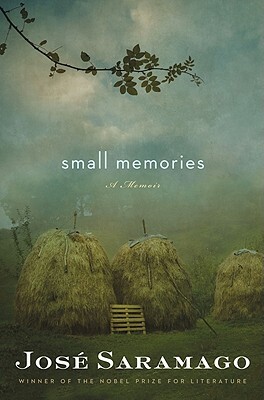 At first glance, Small Memories looks like a run-of-the-mill childhood memoir. Saramago recalls various incidents from his childhood in Portugal in the 1920s and 30s. He writes of his parents, his neighbors, his friends, his schooling—the usual stuff. There’s very little about Portuguese politics; Saramago focuses on the things he would have observed as a boy, and he’s more likely to notice small domestic and school-based dramas than larger historical movements. The child, while he was a child, was simply in the landscape, formed part of it and never questioned it, never said or thought, in these or other words, “What a beautiful landscape, what a magnificent panorama, what a fabulous view!” Naturally, when he climbed the stairs to the church belfry or scrambled to the top of a sixty-foot ash tree, his young eyes were capable of appreciating and noticing the wide open spaces before him, but it must be said that he was always more drawn to singling out and focusing on things and beings that were close, on what he could touch with his hands, on what offered itself to him as something which, without him being aware of it, demanded to be understood and absorbed into his spirit (the latter being a jewel which, needless to say, the child had no idea he carried within him): a snake slithering away, an ant carrying on high a crumb of wheat, a pig eating from the trough, a toad lolloping along on bent legs, or a stone, a spider’s web, the soil turned up by the blade of the plough, an abandoned bird’s nest, the drop of resin running like a tear down the trunk of a peach tree, the frost glittering on the undergrowth. Or the river. Saramago’s characteristic stream-of-consciousness style makes the memoir feel like a story told directly to you by a grandfather or old uncle looking back upon his life. It’s only vaguely chronological; Saramago frequently goes off on tangents or returns to incidents that he’s already described. It sounds like it might be confusing, and I suppose it is if you’re looking for autobiography. This isn’t autobiography—it’s more of a meditation on memory itself. Sometimes I wonder if certain memories are really mine or if they’re just someone else’s memories of episodes in which I was merely an unwitting actor and which I found out about later when they were told to me by others who had been there, unless, of course, they, too, had only heard the story from someone else. This uncertainty becomes a running theme throughout the book, as Saramago notes certain memories that are possibly false or describes the same incident twice but with a different emphasis each time. Sometimes he even remembers the facts differently on a second telling, which throws a new light on a story and leaves readers to wonder which version is true. He comments on how people might adapt their histories or have new histories foisted upon them. His birth certificate, for example, shows an incorrect birth date because his father was away at the time of his birth and could not register his birth with the government by the deadline, so he gave a false birth date. And thus, the official history is not necessarily any more reliable than our memories. I find the whole question of memory fascinating, so I was intrigued with how Saramago weaved this uncertainty into the book. It makes this small book of Small Memories into a vehicle for big questions, which is something I’ve come to expect from Saramago. This book sounds incredibly interesting. I too find memory fascinating (perhaps because my own memories of childhood seem so sparse) and I constantly wonder how on earth people come up with the memoirs they do. I also loved Blindness so I may have to move this to the top of my Goodreads “to-read” list. I liked it an awful lot. He subverts the idea of memoir as truth just enough to make it seem even more honest than a straightforward memoir. I’ve just begun this one, and agree with your assessment completely. Saramago is such a masterful writer — I am so sad there will be no more books from his pen. But I have a few of the earliest ones still to read… I think The Cave has been my favourite so far, though it is hard to say ‘favourite’ for only one among all of his wonderful books. I’m a big Saramago fan, but haven’t read this one. I would have shared your caution about how he’d work with a more normal subject matter so it is nice to be reassured that this book works. I hope that I enjoy it as much as you did. I thought it worked beautifully–different from his other books, but not straight memoir ether. Hope you enjoy it! Must, must read Saramago. I have been meaning to for AGES… sigh. That does sound so familiar, doesn’ it? Ha ha–it does sound familiar. I could say that about dozens of authors! I don’t read very many memoirs, but I do really like Jose Saramago, and I am really interested in the idea of memory. And as you say, Saramago was really brilliant when it came to asking the “big questions” so I am not at all surprised to hear that this was both a powerful and provocative read. I really had no idea if he would depart from his usual style for this, but it was recognizably Saramago, which made it a pleasure. I’m fascinated by memory, individual and collective, so this one sounds good to me. But I’ve never read anything by Saramago, his style is a bit intimidating. I find that once I’ve adjusted to his style, it flows pretty easily. But if his style intimidates you, this might be a particularly good book to start with because it’s so short. Interesting that he’s not political, but on the other hand, he was just a kid and wasn’t aware of that type of things. Typical of him to taunt you with what’s true, what’s official and what’s imagination. I’m saving the Saramagos I haven’t read, and this is one of them. I’ve recently read History of the Siege of Lisbon and loved it. Have Caim next on the bookshelf. He does bring up a few political events, but from a child’s perspective, which makes perfect sense. I’m really looking forward to continuing my Saramago reading. I keep hearing great things about the others I haven’t read. I’ve only read Blindness and Seeing, but based on those two would be extremely intrigued to check out a more realist book by Saramago. And love what you say about the unreliability of memory and the slipperiness of the past, even when backed by supposedly “objective” documents. I have yet to read Seeing, even though I’ve gotten it from the library a couple of times. Must get to that one, as well as the copy of The Gospel According to Jesus Christ, which is on my shelves. Memory is a fascinating topic, and I really liked the way Saramago handled it.